The racial climate in the United States, particularly the relationship among Blacks and Whites, has been historically established as an inferior versus superior dichotomy, respectively. This social structure predicated on racism manifests itself in different institutions of our society, including the institution under evaluation, education. While this racial hierarchy applies to all people of color, I do believe that there is a relative spectrum in which Blackness and Whiteness have been most distinctly separated. In light of that, I take interest in the intersection that the circumstance of Black students on the campus of a predominantly White institution presents. This intersection encompasses the following: the climate of the educational system post-segregation, Black individuals in predominantly White spaces (in light of the societal hierarchy), and how inequality presents itself through the opposing experiences of Black and White students. In the research that I have conducted, the Black student experience on the campus of Michigan State University is my focus, considering all of the overlapping social factors effecting this experience. The questions that I originally aimed to answer were in part based on my own experiences as a Black student. While the broader quest has become to uncover the mechanisms that many Black students employ to adjust that is customized to their particular positionality, I was initially more specific. I originally planned to hone in on the informal and formal alliances that work to assist in acclimating oneself but after an anthropological immersion into Black student life I have been able to redefine what constitutes as “informal and formal alliance” as well as the word “alliance” in itself. I have found that many of the reoccurring themes I have discovered in research tend to serve the purpose of an “alliance” in the renewed sense of the word. The meaning of an alliance comes to be the opposite of alienation. By establishing relatability, or being understood, uplifting one another, and building a sense of community we arrive at an alliance. After a couple of interviews and participation in community events, I began to discover the broader question I would like to answer and also that the aforementioned characteristics of an alliance would be appropriate avenues for answering the question, while realizing that discovery of new themes is to be expected. Considering the racial climate of the United States and the microclimate on the campus of a predominantly Whites Institution, that is in many ways representative of larger U.S. society, I estimate that the Black student experience involves relatively greater measures of acclimation. These measures of acclimation are rooted in combatting racism, microagressions, and alienation in an effort to secure an environment that feels a bit more conducive to healthy living and learning. I argue that the social climate very much so contributes to a healthy learning experience and also that Black students’ particular experiences adjusting to university life is partially specific to their racial identity. “‘For those of you who are going to PWI’s just know that you deserve to be there just as much as any other White student in that room, if not more’, because a lot of times you know the old saying ‘You have to work twice as hard to get half of what they have. '” Jalen and I alike are well-versed in the sayings that have travelled through generations of the Black community. These words both acknowledge inequality and deep-seated oppression seeking to reinforce the spirit of resilience. As we closed our interview session, I asked Jalen to offer some words of advice to a student like himself embarking on the college journey at a predominantly White institution from a predominantly Black background, like his own high school and hometown, Lewis Cass Technical in Detroit, MI. He offers some of his own advice in addition to a rendition of the advice that was offered to him as a high school senior by his former English Literature teacher, Dana Davidson. Thinking about the meaning of Dana Davidson’s advice to her class of predominantly Black high school seniors, it is important to consider why it is neccesary to reinforce worthiness. In my several conversations with fellow Black students , many of them expressed that their dialect, their experiences, and their backgrounds were grounds for alienation from the predominantly White MSU community. Sitting in a classroom conducting an interview with Shomari Tate, a Political Science/Pre-Law Senior here at MSU, our conversation topic was acclimation to the university. After giving some visually apparent conscious thought of his personal practices, he arrived at what he had been doing, which is subconsciously assimilating to what sort of excuses his Blackness in the face of White dominance when he says, “I had to watch the way I spoke with teachers with friends just to fit in”. He equates putting on his “professional voice” with acclimation to the university describing it as “unfortunate” because in his estimation White students don’t have to abandon themselves to acclimate while Black students must uphold this “double consciousness” to survive alienation. Double consciousness: It is a concept coined by sociologist W.E.B. DuBois that explains the identity binary experienced by Black Americans where one must perceive themselves not only through their own perspective, shaped by Blackness, by one must also shape themselves through how they anticipate to be perceived by the outside, mostly White, world. Double consciousness is said to be the result of internalized anti-Blackness that you consciously (or subconsciuosly) address when presenting oneself in speech, mannerisms, etc. Jalen Smith, a Journalism Senior here at MSU, aligns his thoughts with Shomari when he says “Don’t feel like you are not as smart as the White students just because you don’t speak ‘properly’, like they claim. Whatever proper English is supposed to be.” Like Shomari, Jalen intends to shed light on the racially biased standard that has been set for what is “proper” or “professional”. Jalen goes a bit further to draw the connection for what this established standard means for Black students whose dialect does not align with the “proper” and “professional”. Intelligence is essentially equated with your efforts to abandon speech that is closely associated with Blackness and thus inferior. As Shomari and Jalen have collectively unwrapped, preparation for attending a predominantly White university for Black students presents some questions of identity and questions of belonging. Questions that Jalen’s high school teacher, who also attended a predominantly White Institution, expected her students would encounter. 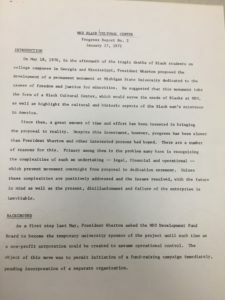 In fact, my trip to the Michigan State University Archives and Historical Collections has landed me a look even further into the past than a middle aged high school teacher to establish just exactly why “deserving to be here” in conjunction with one’s Blackness is a sentiment that has travelled through time in the history of Black students on campus. 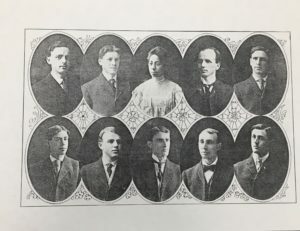 I discovered what looked like a yearbook page of some of the students in the 1907 graduating class (below). One of the students is Myrtle Craig Mowbray, MSU’s first Black graduate, and she is pictured in the center of the first row. While my quest was primarily for written materials that offer historical insight and explanations into the Black experience, I am depending on the infamous saying “A picture speaks a thousand words” for this one. In 1907, Myrtle Craig was the first and only Black graduate. Although there were other graduates, other than the students pictured around her, none of them were African American. The picture helps to actualize the fact that there was a beginning for African American students here on campus that was not in 1855 (when the university was founded). I find in my field study that the African American presence at MSU, and college period, is often judged as a numerical underrepresentation. It can be taken for granted that perhaps lack of education is inherent in Blackness when you do not provide the historical contextualization of this underrepresentation.While I am confident the other students know of the circumstances that Black men and women faced who pursued education over a century ago, however to present a picture like the one above with one Black woman among nine White men is the reminder of the established social structure that precedes African American students at Michigan State University. On my journey to define “the college experience” from the perspective of Black students, I managed to uncover some common themes that I will use to explore acclimation mechanisms that Black students may employ. My personal conclusion is that the root concept for all of these mechanisms/themes is alliance. Defining alliance as the opposite of alienation, or to be associated with something or someone other than one’s self has helped me to determine that communing building, racial uplift, recognition and representation, and relatability are characteristics of an alliance. In the words of Tessie Golden, Biomedical Laboratory Diagnostic sophomore, “As a Black person, you have to make a home”. where everyone knows that MSU Advantage is having a show biweekly on Tuesday and that the campus’ NAACP chapter is hosting their weekly study tables on Friday evenings. Stepping into these “comfort space(s) for Black people” as Champagne puts it is an immergence into a community where “you don’t feel excluded”. Reaching back to my discussion of dialect, mannerisms, and background/experiences being “grounds for alienation” of Black students, we can begin to uncover just how form a community, or safe space, where all of these things in common are acceptable. Not only are they acceptable, but there is a shared understanding of the meaning behind certain word usages, gestures, and references to experiences that Black students may have alike. That is how you harbor a sense of belonging. arrived for what is referred to as the pre-show just sort of falling in line for an impromptu hustle (series of pre-choreographed line dances commonly done to R&B soul music) session to Aaliyah’s “Rock the Boat, “that’s my jam”‘s could be heard in the distance and I knew I had stepped into a community. I mean a “community” in a sense that everyone sort of has a shared understanding that someone’s jam is a song they love and also knows exactly which hustle to do when they hear Aaliyah’s “Rock the Boat”. 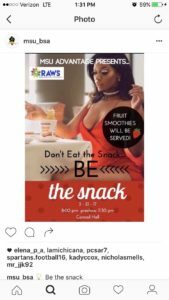 The topic of this week’s show is “Don’t Eat the Snack, Be the Snack” and participating in Black Twitter means that you would not have trouble understanding that “a snack” in the second usage of the word is colloquial for an attractive person. Although presentations and a short play series (both of which constitute the “show”) would follow, the disc jockey played more “jams”, Keshia Cole “Let it Go” and V.I.C. “Wobble Baby” included, as students came in, some sat done their bags and joined the hustle session while others spotted their friends carried amicable conversations singing along and bobbing their heads to the songs that were agreeable to most of the crowd. Even if it wasn’t your “jam”, you knew the song and may reluctantly bob your head or sing parts that you couldn’t help but recall. After a fellowship that happened sort of naturally with the help of the disc jockey, diving into what is a discussion of maintaining a healthy lifestyle, if that was not clear via the event title, was next. It became clear to me that this feeling of a community came much before the actual event even started and it began with the advertisement posted in the social media account of Black Student Alliance giving Black students options for where they could fellowship and discuss things that on surface value may seem universal, like maintaining a healthy lifestyle, but the cultural implications like references to “chronic illnesses affecting our community” are inescapable. While MSU Advantage does not explicitly cater to Black student, it is an organization with a predominantly Black following and from that a community is subconsciously formed where Blackness is normalized. I truly realized the meaning of “Black counterpublic” at a gathering referred to as “Soul Food” on a rainy Friday evening in Brody Hall. This “loose collection of people in an array of social sites-churches, political organizations, mutual aid societies, etc. -where class and gender diversity crosscut racially homogenous gatherings” (Hartigan, 2010) manifests itself in Brody Hall on that Friday afternoon in the form of card games, crackin’ on each other (or making fun of each other in a friendly way), and every now and then a side conversation about our goals. 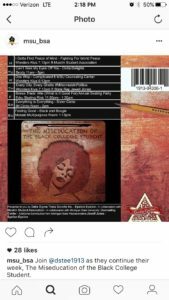 Although, pizza was on the menu that night the title “Soul Food” demarcates a Black counterpublic. Soul food is African American cuisine and it is described to me by someone, who I later found to be a facilitator of the loosely structured event, that soul food is a point of connectivity among African Americans and an appropriate name for the gathering because of the purpose to community build via establishing connections among Black students and faculty. Somehow sitting at what use to be a Brody classroom did start to feel like “my grandmother’s house on Thanksgiving” as the goal of the event had been described to me. While playing Phase 10, a card game, with a group of 5 people of which I only knew one I realized at the end that I felt like i knew them because of our similar joking patterns or references to back home”. Somehow without being present Champagne, in saying, “In a smaller community and with Black people, I’m relating to them because I am a Black person myself. It seems like it’s a little bit more of a community.” “You relate to them automatically because you’re Black.”, she aligns her own truths with the experience that is felt at “Soul Food”. Like the young woman, who raised her hand to express appreciation for a “Sister Circle” event I attended, said “It’s cool to have a net to fall back on like ‘I feel you, girl'”. Events where reliability among Black students does not have to necessarily be supplemented with exogenous explanations, but instead Black students can just relate to one another is crucial when considering the broader context. Although the sub-community for Black students may be an area of relatabiliity and understanding, it is within a broader context where the dominant population does not necessarily normalize the African American perspective. Below, Shomari Tate and I hold a conversation surrounding the necessity to be able to relate for thorough acclimation to the school environment. Reliability in his estimate is “indicative of the divide” between the differential experiences of White and Black students. Shomari regards being able to “mesh with” dominant White culture as “tools” for acclimation to a predominantly White Institution. This is a practice that White students have the privilege to not have to employ because they are in a setting where they are normalized. Consequently, for Black students, not being normalized means that you fall under what has been formally defined as the “racial optic”. Stephen Steinberg defines the concept in Race Relations: A Critique, to be a phenomena in our societal racial climate where “blacks not whites, must be the ‘problem’ under examination and thus the object of inquiry.”(Sternberg 2007) He continues, “Indeed in this vast canon of studies on race, nearly every aspect of the Black body and soul has been scoured in a misdirected search for the reasons for racial hiearchy” (Sternberg, 2007) which aligns with Shomari’s comments that not only is his presence denormalized but there is implication of inferiority when other students question question his sole academic merit. This “petting zoo” he refers to is academically known as the racial optic. Having differential experiences, dialect, and background as a Black students deems you less relatable thus subjecting you to this alienation, or racial optic. Shomari’s words represent the challenge presented to Black students attending PWI’s across the country. You are essentially representing your race many times in the face of anti-Blackness, ill-informed stereotypical ideas of Blackness, and White dominance. In her discussion of the “Challenges African American Face at Predominantly White Institutions”, Mercedes Benson analyzes the social climate of PWI’s to be one that meets Black students with “negative assumptions about Blacks and Black culture” and in the same breath Benson eloquently puts it that though it is now legally mandatory that PWI’s accept students of color “their perspective is not incorporated into the fabric of the university”. So, from Shomari and writer, Mercedes Bensons’ contentions we arrive at two facets of representation. One lies in the image of Black students that precedes them and as Benson mentions creates a hostile learning environment. While the other, lies in Black students’ perspectives being considered in the creation of curriculum, programs, resources, and other such things that form the learning landscape. Although, the two facets are very connected to one another, on the premise that implicit racial bias has the ability to ingrained in institutions. Implicit Racial Bias: subconsciously attributing negative qualities to racial groups deemed inferior via the established racial hierarchy and consequently attributing positive qualities to racial group deemed superior via that same hierarchy, usually Whites (via the concept of White superiority). The images below are pictures of documents I retrieved at the MSU Archival Documents and Historical Collections that I believe allow a peek back in time of the quest for Black student to be recognized on campus. In 1972, following the murder of several Black students on college campuses in the U.S. south, the MSU Black Community, with the support of President Clifton Wharton rallied to have a Black Cultural Center built as a physical dedication and representation of “cultural and historical aspects of Black men’s existence in America”. The center would also serve as a university resource for Black students recognizing unique needs of Black students. The second image is actually the fourth page of this update of this “progress report” regarding the status of a Black Cultural Center on campus. 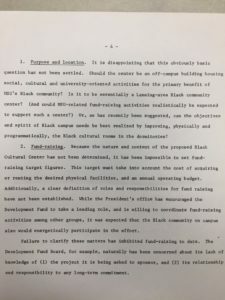 The page spells out the controversy around the purpose that a Black Cultural Center would serve that could not be executed within dorm “cultural rooms” as opposed to a cultural center. The fourth page also spells out the lack of financial support because of failure to determine the “nature and content” of such a center. Written in between the lines, though, is the lack of support financial and otherwise to create a physical representation and recognition of the African American presence on campus. Fast forwarding 45 years to the present day I wish to highlight recent alumnae Champagne Smith’s sentiment that many of the Black student organizations are the result of Black students taking the initiative. My purpose is not to point fingers at the university but in celebrating the agency that Black students have employed in taking on representation and recognition for themselves. “They don’t treat us the way this competition made me feel, like royalty. I don’t feel like that on campus.” Champagne, former Miss Black MSU, speaks about the importance of centralizing and celebrating Blackness in Black counter publics on campus such as the Mr and Miss Black MSU pageants and the Black Power Rally. She says it is precisely because society, and campus being representative of society in many ways “tries to make us feel powerLESS” that we must put on events that empower Blackness. Reflecting on her own experience as Miss Black MSU, Champagne members feeling “like royalty” and feeling expressed the importance of such an events where “her face, her skin tone” is represented. 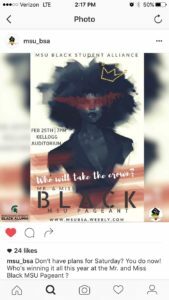 Reflecting on my own experience at the 2017 Miss Black MSU pageant, it was an event that illustrated all of the themes that define the Black student experience here at Michigan State University. Sitting in a room where somehow students ranging in age from 18-24 all know the words to soul artists Frankie Beverly and Maze’s 1980’s jam “Joy and Pain” because our grandparents alike never let us forget it, relatability comes to mind. Though we may not all know each other we collectively celebrate the empowerment we feel when one of the contestants Jeffrey Williams’ in a tone of affirmation and confidence suggests that we work collaboratively to “graduate ten more Black men per year” to lift the graduate rate of African American students. Students in the crowd cheer and clap and a few shout “That’s right!” It is the event in itself that creates a platform for Black students to be represented and recognized; that Blackness is normalized and celebrated; and in that room a sense of belonging is felt. Less of what I ventured to prove is that Black students are the minority and that their experiences as students on the campus of a predominanly White institution are different. Undergraduate enrollment in Fall of 2016 for Black Students was approximately 8% in comparison to 76.8% of the undergraduate student body being White students, according to records collected by the MSU Inclusion and Intercultural Initiatives website. In my estimate, that is enough to prove that White students are inherently centralized. I am more interested in exploring how Black students navigate such a social climate. I specifically embarked on a quest to uncover exactly how acclimation is achieved from the perspective of Black students. What I found is that there is no single answer, but that my themes that I managed to organize my observations into were pretty representative of what Black Spartanhood entails. In the beginning, I mentioned that alliance would be my educated guess for how acclimation is achieved. Through the comments of some of my key informants like Tessie Golden I realized a new meaning of the term alliance when she says, “If you come to this school and don’t try to find that alliance, you’ll never be understood, you’ll never find that inner peace, you’ll never find that relief.” “Alliance” in the context of the Black student experience becomes something that is felt, like a safety net on which to fall. To feel supported, to be celebrated, to be understood, to belong, and lastly to have your presence acknowledged is indicative of an alliance. So it turns out that community building, reliability, representation and recognition, and uplifting are, in fact, characteristic of an alliance. What i hope to have achieved here is to give meaning to the Black student experience beyond the statistics that indicate our underrepresentation and other things characteristic of being a marginalized group. In fact, I purposely sat aside the many statistics available because it happens too often that statistics precede people’s lived experiences and words. Being a member of the Black community myself has made this a unique experience because I got an opportunity to anthropologically assess some of my own experiences. Some of the challenges I encountered were interesting. For example, I recall on many occasions while writing wondering how I would explain ideas, phrases, and references to a non-Black reader. I found myself going back and saying “Wait, is this endogenous to the Black community.” I laughed aloud as I typed out the meaning of “my jam”. Being a Black student taking on the Black community as a subject of inquiry was also very fulfilling. It is liberating to be a member of a marginalized group and have your experiences validated. To make the connections and grant meaning is empowering especially when invalidation is undeniably common. As Jalen Smith says in his advice he offers to incoming Black freshmen, “you’re experiences are not invalid.” Observing, listening, and venturing to understand is validating. If I have not accomplished anything else, I think that I have validated the experiences of fellow Black students and for that, I am proud. Benson, Mercedes. “Challenges African American Students Face at Predominantly White Institutions.” Student Doctor Network. March 29, 2007. Accessed April 04, 2017. https://forums.studentdoctor.net/threads/challenges-african-american-students-face-at-predominantly-white-institutions.385777/. Hartigan, J. (2015). Race in the 21st century: ethnographic approaches. New York: Oxford Unviersity Press. MSU Black/Cultural Center, Progress Report No. 2, Box 2359, Folder 3, Ruth Sims Hamilton Collection UA 17.269, Michigan State University Archives and Historical Collections East Lansing, MI. “Myrtle Mowbray, ’07: MSU’s First Black Graduate Remembers M.A.C. “, from the MSU Alumni Magazine, November 1972, MSU information, People, Mowbray, Myrtle Craig, First Black Woman Graduate, Michigan State University Archives and Historical Collections East Lansing, MI. Senior Class Picture 1912, MSU Information, People, Mowbray, Myrtle Craig, First Black Woman Graduate, Michigan State University Archives and Historical Collections East Lansing, MI.